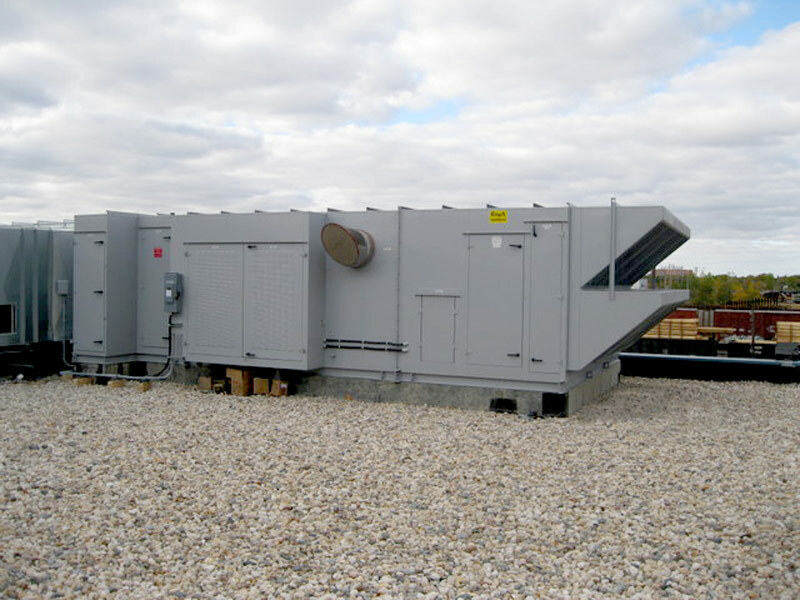 Engineered Air | One of North America’s largest fully integrated manufacturers of made-to-order heating, ventilating, air conditioning, refrigeration and energy recovery equipment. Our standard model DJS Series indirect fired heating operates with a nominal combustion efficiency of 81%. The DJE Series indirect gas fired unit best matches our previous model series, also with the nominal combustion efficiency of 80%. The most advanced model and highest combustion efficiency rating in the markeplace of 91% is the DJX Series indirect gas fired unit. All DJ Series models feature high turndown burner, Stainless Steel two or three pass heat exchangers which offer longer heat exchanger life expectancy in cold climate operations with 100% outside air operation capability. The DJ modes are available with heating capacities between 100 and 3,000 MBH. With the proven exclusive Engineered Air DJM Controller all DJ models are capable of 15:1 burner turn down ratios with a range of control options. After 28 years one of the original building corridor pressurization units required extensive repairs. Rather than fixing the original unit, the Condo Association started looking for new equipment that would improve operating efficiency and temperature control. Roxboro House is an exclusive Calgary residential community located on the banks of the Elbow River at Fourth Street, gateway to the historical Mission District. The building is minutes from downtown and set amidst some of the cities finest eateries and many tranquil walkways of the Elbow River. After 28 years one of the original building corridor pressurization units required extensive repairs. Rather than fixing the original unit, the Condo Association started looking for new equipment that would improve operating efficiency and temperature control. The original unit was located in a service well mounted high above the parkade entrance ramp. This made access to the equipment extremely difficult. The equipment service well could not be expanded to provide more room for the new equipment because of its location. The new equipment had to fit into the existing location and maintain building code clearances. Supply and outside air ductwork locations could not be changed. The old equipment also included a DX cooling coil and separate condenser section which meant mechanical cooling also had to be included. 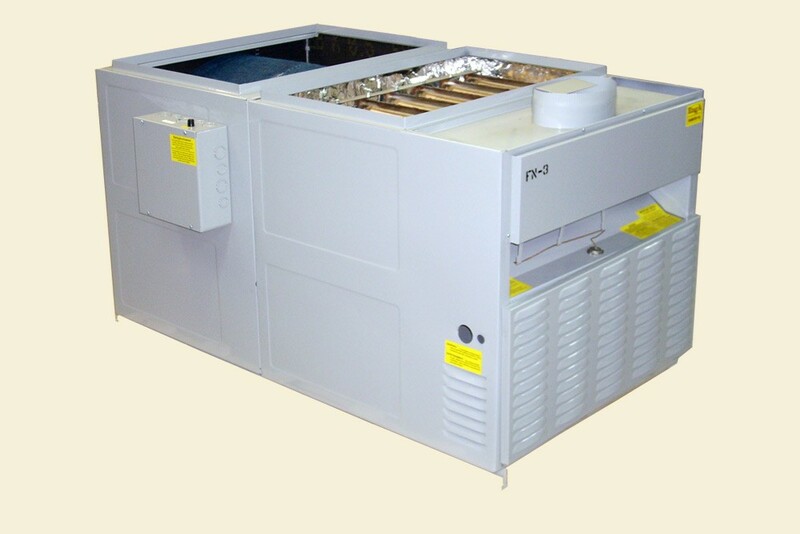 Working with the installing contractor, Engineered Air sales proposed a custom model DJ100/O as the replacement unit. Because of the limited equipment space, it was not feasible to propose a packaged heat/cool unit or a new condensing unit. 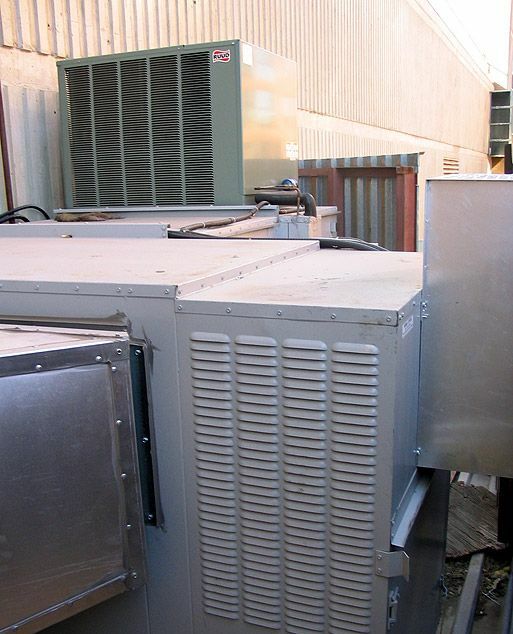 It was decided by the installing contractor to keep the existing condensing unit and match it with a new DX cooling coil in the DJ100/O. The new DJ100 /O was built with custom dimensions to meet the service well space constraints and match the existing duct connections. 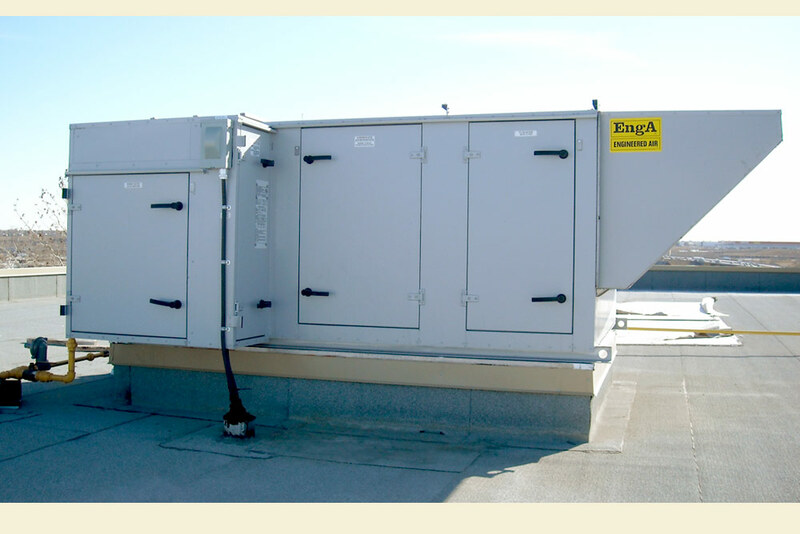 The unit was installed in the existing space and meets building code and maintenance access requirements. The existing condensing unit was installed on top of the DJ100/O. The Roxboro tenants now have a new building corridor pressurization unit with improved efficiency and greatly improved temperature control. Due to continuous product development, specifications, dimensions and capacities are subject to change without notice. 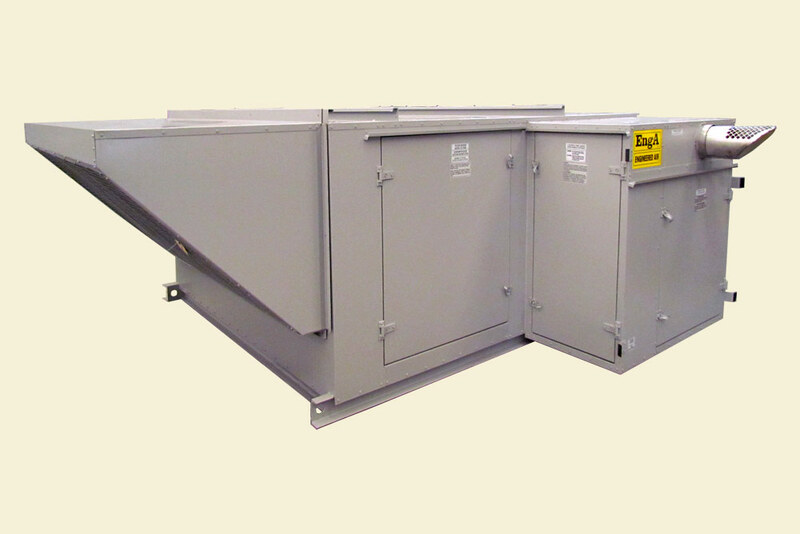 The DG Series indirect fired heating units utilize our Engineered Air High Turndown Burner or optional purchased burner. Our Stainless Steel two pass heat exchanger offers long life expectancy and efficiencies as high as 82%. 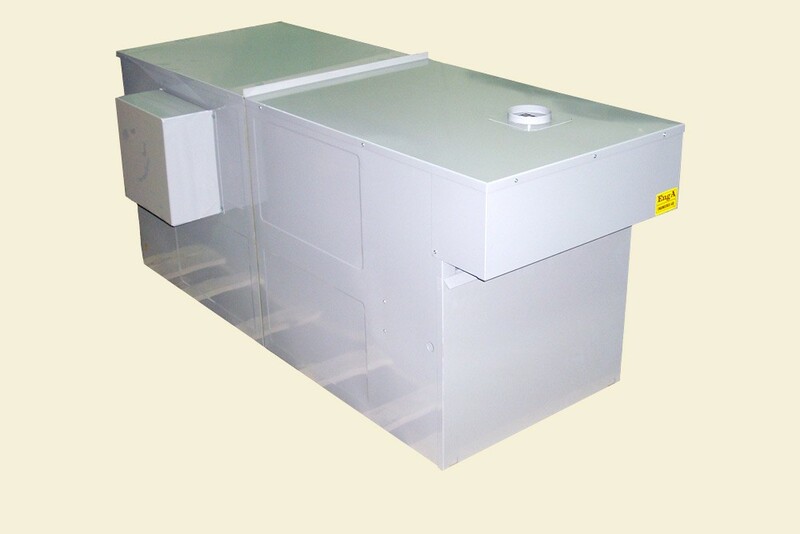 The DG Series of industrial indirect fired heaters offers heating capacities between 1,400 and 7,500 MBH. When supplied with the Engineered Air G-TRAC control and our High Turndown Burner, the unit is capable of 20:1 turn down ratios. Optionally the DG Series units can be configured for high discharge temperature industrial applications. 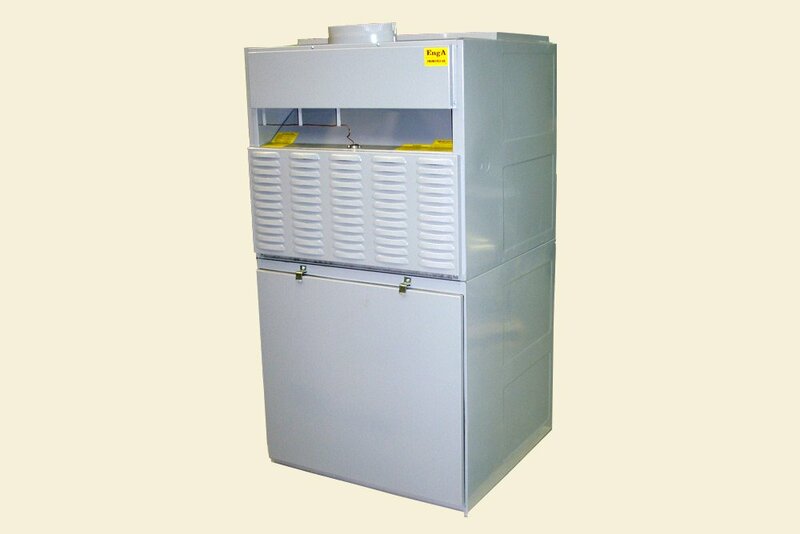 Commercial - Industrial Indirect Fired Heaters. 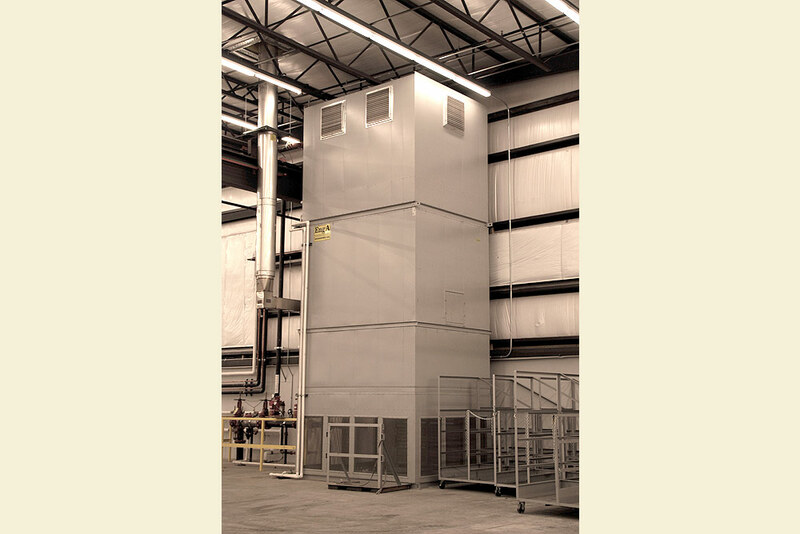 Space Temp Air Turnover Systems are designed specifically to provide a uniform space temperature throughout the volume of the space to be heated. 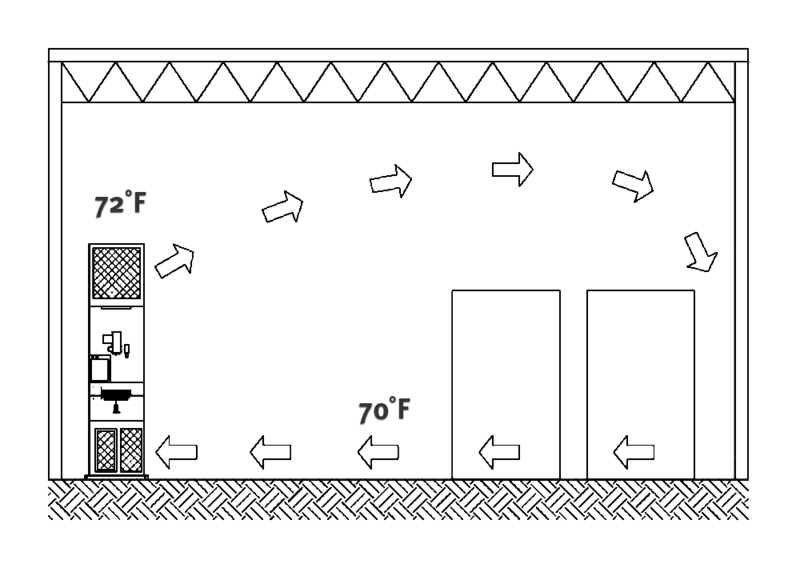 Uniform temperature is accomplished by providing a high volume air flow rate, coupled with a relatively low discharge air temperature. This ensures that all areas of the building experience air motion, virtually eliminating stratification. No more bumping the thermostat to make sure “that the cold spot over near the door” is adequately heated, while overheating the balance of the building. Energy costs are reduced, and the comfort level is improved. The Engineered Air DJX Series furnaces redefine heating for the commercial – industrial market place. Our complete line of indirect gas-fired heating products incorporates independent proportional control of combustion air and gas flow. This ability to maintain the proper ratio of combustion air to gas burned is called “linearization”. With Linearization our DJX Series product maximizes heating efficiency and Energy Savings. DJ models meet or exceed the ASHRAE 90.1 2007 and ASHRAE 189.1 high performance building requirements for (non weatherized) steady state at high fire operation. The DJX heat exchanger was engineered to operate at nominal 91% efficiency throughout its complete firing rate and with increased efficiency during part load conditions. The DJX Series exceeds standards and optimizes energy performance.